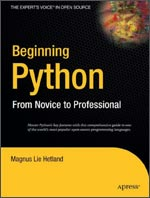 "Based on the author's extensive experience in providing Python training courses over that last eleven years, Learning Python gives you an excellent grounding in the subject from it's 680 pages of content...Moving on through the book you'll get a rapidly accelerating level of difficulty, and it wouldn't be far wrong for us to say that this book might be all you need." "This is a great introduction to Python. People who can already program will find the book moves quickly enough, but beginners will by no means be lost. The book covers everything Python - including an introduction to some more advanced concepts like Django. At the end of the book, there are several fantastic projects which tech you to make something very cool - like a forum, a chat client (like MSN) and a file sharing server like Bit-torrent. A great book that I highly recommend!! " "In cooking, the beauty of a recipe is you get to spice up the dish however you like it or modify it to use whatever ingredients you happen to have on hand. The procedure is exactly the same with the recipes in the Python Cookbook: the user is not only encouraged but expected to modify the solution to fit his or her own needs. These solutions are meant not as complete answers, but departure points or templates for your own use. 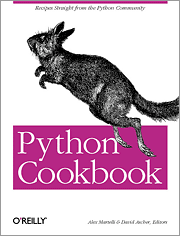 "So although Python doesn't actually taste like chicken, this cookbook contains some truly delicious - maybe you should read that as 'very useful' - recipes for anyone who regularly works with this language. 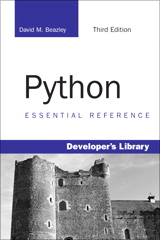 If yours is a Python shop, you need this one on the shelf somewhere!" 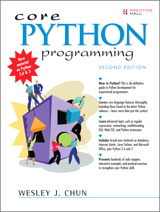 "For anyone who programs in Python, David M. Beazley's Python Essential Reference, 2nd Edition will serve as a capable and exceptionally competent guide to current Python syntax and library modules. Concise, yet authoritative, this book sets a high standard as a one-volume reference to this powerful object-oriented programming language. 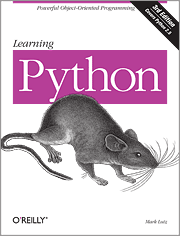 "Although the author claims that this title is not really a tutorial, the first 100 pages actually provide an excellent guide to the basics of Python as a language. Geared especially to the experienced programmer seeking to see what's different (and potentially better) about Python, sections on the language itself will let you ramp up on the basic and advanced topics. Short sections with code excerpts that show off essential language features will help you learn or enhance your knowledge of Python quickly. Standout sections here include excellent coverage of object-oriented features, like "special methods" that will let you add custom classes to Python that are just as flexible as built-in classes. "With a remarkably clear presentation style, this well-organised reference offers a compact and worthy guide to today's Python that's sure to meet the needs of many working programmers."